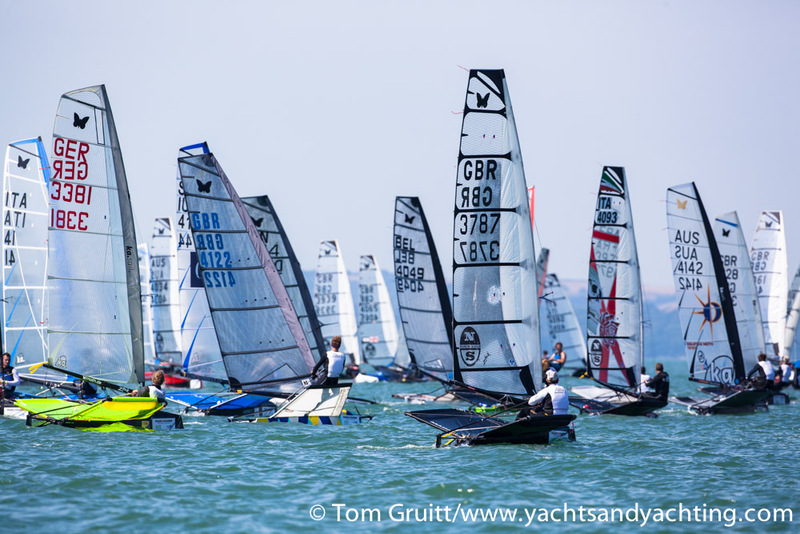 The sweltering heat and lack of wind at Hayling Island on Day 3 caused havoc for the record Moth fleet and headaches for the race committee who only managed to get two races away in for Yellow fleet and one for Blue fleet, bringing the Qualifying Series to a close after five races. Sunday's Yellow fleet were sent out first to play catch-up and completed qualifying Race 4 in around 10 knots that saw Chris Rashley hooning down the racetrack to eclipse early leaders Mike Lennon and Paul Goodison on the final run. "Solid day. Went out and raced the re-sailed race we didn't finish yesterday and ended up coming through to win. It was shifty offshore, but a reasonable 8-10 knots of pressure. I got past Mike by gybing at the final windward mark as we had a right shift and the pressure was running down the right hand side and sailed around Mike who went down through the middle. He wasn't to know the shift was coming when he rounded and it was very difficult conditions for him to defend in. If I hadn't gybed straight away I would have ended up fifth or sixth," Chris Rashley said. 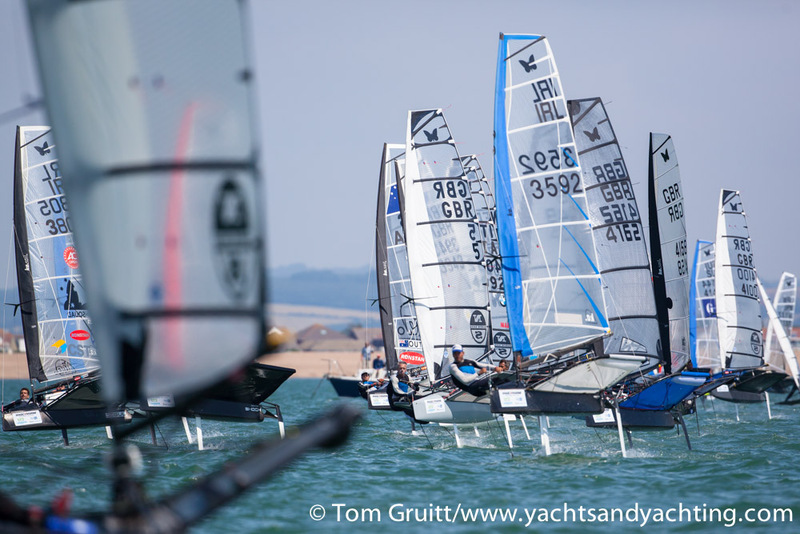 "You can't get much separation from the fleet and there are some really competent sailors out there who are going to put up a big fight in the finals. I think Rob Greenhalgh has got a very good chance of walking away with the trophy at the end of the week, so has Scott Babbage, Josh Mcknight and you can never write off Nathan Outteridge. 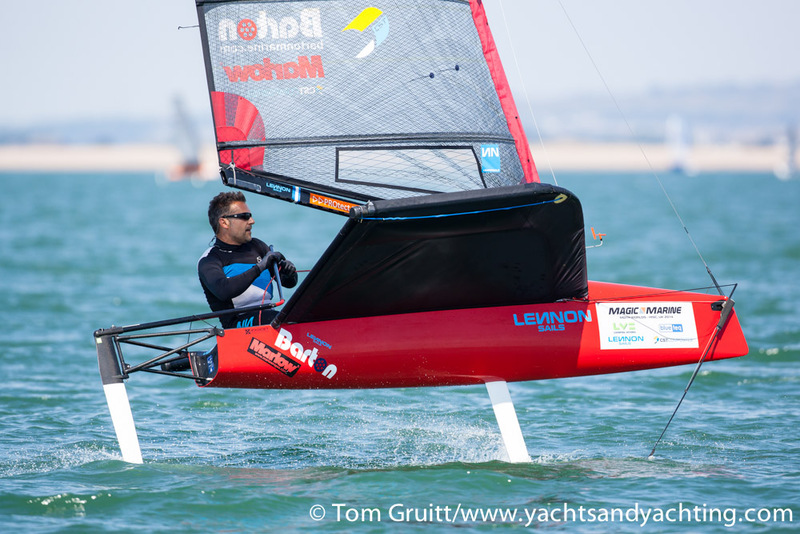 He's the best dinghy sailor in the world and he will be up there at the end of the week," Rashling added of advancing to the Gold Fleet. 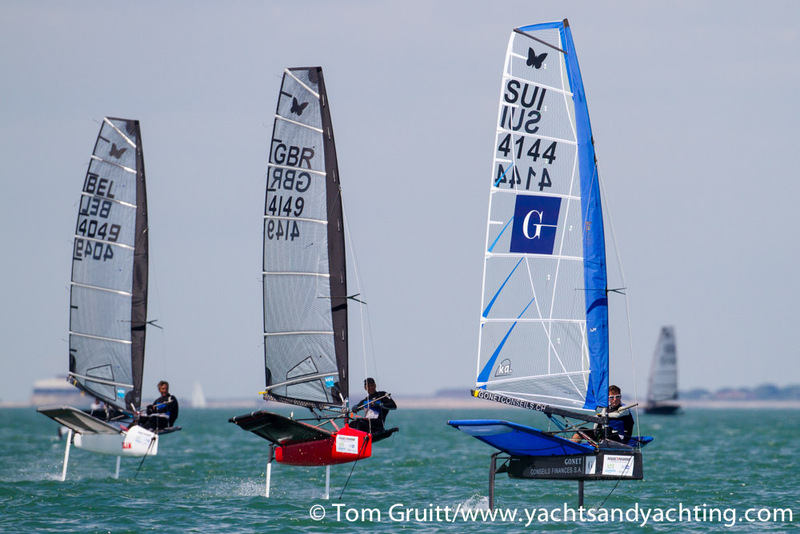 Then it was on to Monday's Yellow and Blue fleet racing and Australian 49er Olympic Gold Medallist Nathan Outteridge grabbed the bullet ahead of Robert Greenhalgh (GBR) to halt his successive wins. "It was a good day. A lot of waiting around but we got a good race in and I finally got a bullet so happy with that. I haven't raced against Chris Rashley, or a lot of the other top guys, but I've raced Rob (Greenhalgh) every time and he's going pretty quick so it was nice to get one up on him today. 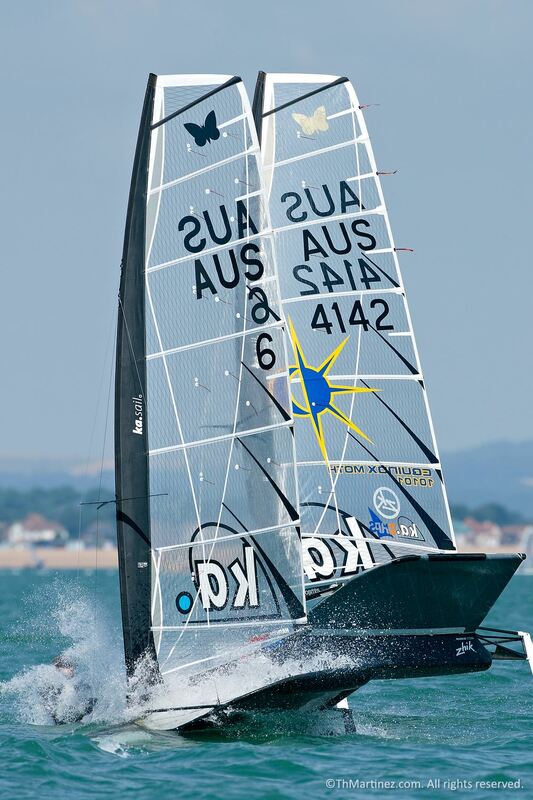 I think there's about six or seven boats that can probably win the event because the points are pretty close," Outteridge said. "I think people are just putting a lot of time into their boats and understanding their equipment. Obviously the guys over here have been sailing a lot at this venue, but of course we've had very different weather with light and flat conditions. I think for the finals it's only going to get lighter. I'm quite happy. 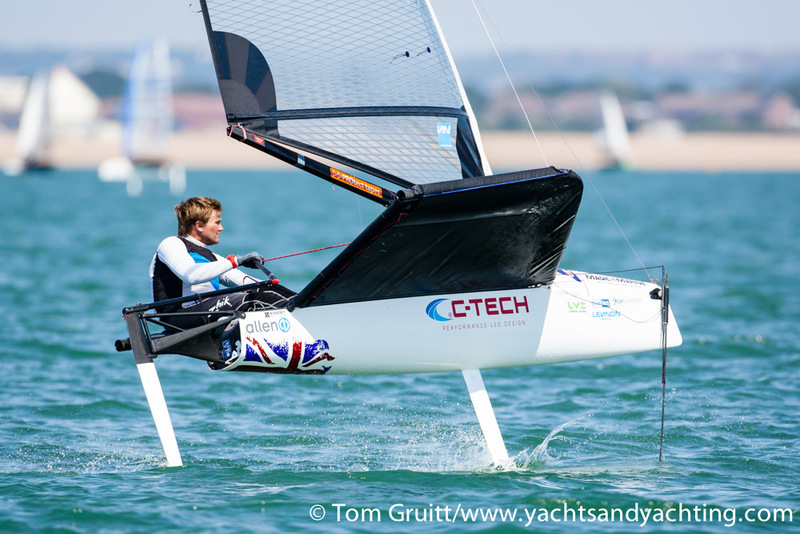 I've got big foils and a stiff rig, like what I was using in Hawaii, and it's getting me through at the moment," he added. On Tuesday the competition it set to intensify further when the fleets are split into Gold and Silver divisions andthe leading competitors will be pitched against each other head to head.